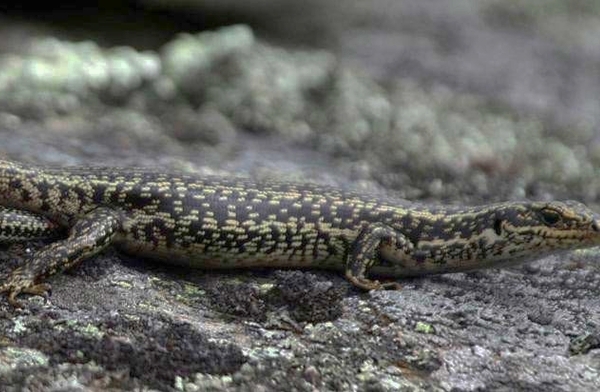 Grand and Otago skinks are two of New Zealand's most distinctive and impressive lizards. Known as giant skinks, they are our largest lizards, with Otago skinks growing up to 300 mm in length and grand skinks 230 mm. Unlike many lizards overseas, both species are omnivorous, diurnal, and don't hibernate. They can live for up to 20 years in the wild, and like all lizards in this country, give birth to live young - two or three a year. Both species are distinctively marked, which is why southern Māori know them as mokomoko. Grand skinks are black with yellowish flecks, and Otago skinks, black with grey, green, or yellowish blotches. These cryptic colour patterns provide great camouflage, amid the lichen-covered schist rocks they inhabit. Grand and Otago skinks give birth to fully-formed young. When they're born, they really hit the ground running. Newborns emerge head first and without so much as a thank you to mum, the babies head for the sun and start hunting. They usually have three to six babies a year. Both species are unique to Otago,and are two of New Zealand's rarest reptiles. They are now found in only eight per cent of their former range and have the highest possible threat status, 'Nationally Critically Endangered'. Their original distribution was upland Otago from near the east coast to as far west as Lakes Hawea and Wanaka, and the Lindis Pass area to the north. Until very recently it was feared that both grand and Otago skinks could be functionally extinct within a decade. That is that they would dwindle away to a point from which they could not return. Thanks to recent research breakthrough, it is thought that fate will not now be the case. The two species share similar habitat, distribution, habits and diet; feeding on a wide variety of insects, fleshy fruits, and even smaller lizards. Today's populations are found in small occasional pockets within Otago. By far the strongest numbers are found in the Macraes area in the east, particularly in the DOC managed Macraes Conservation Area where important management research has been carried out. Grand and Otago skinks live in very specific habitats - secure, sheltered crevices in large outcrops of schist, known as tors. They're exceptionally well adapted to the cold upland, tussock and tor landscape they belong to. Even when there's snow on the ground and icicles on their rocks, if the sun is out, they'll bask on a rock ledge. Monitoring suggests there may be somewhere around 2000 of each species currently alive. There are no suitable off-shore island habitats within or outside their natural range to offer them security. Ensuring that both species survive on mainland New Zealand is imperative. Achieving that is the main aim of DOC's Grand and Otago Skink Recovery Team. By far the greatest threat to either species is predation by introduced animal species: feral cats, stoats, weasels, ferrets - even hedgehogs have been implicated. They are also quite naive, in the sense that they simply aren't aware of the threat cats, stoats and other mustelids pose. As a result they can easily fall prey. Beginning in the late 1990s a six-year project at the Macraes Conservation Area monitored grand and Otago skinks before and during trapping operations for feral cats and ferrets. The results showed that skink numbers were still declining and population modelling suggested that both species could be functionally extinct within 10 years. The results showed a major breakthrough in predator control, with a startling recovery in the protected populations of up to 94% in just three years. This is the first time on the New Zealand mainland that there has been such a dramatic recovery in a critically endangered species. This has given DOC's Grand and Otago Skink Recovery Team a major confidence boost. They have now extended their trapline in the Macraes Flat area to a total length of 60 kilometres; their research showing that intensive trapping is the most cost-effective form of management. An important adjunct to the research work was the recovery team's development of a ground-breaking photo re-sight monitoring programme. This is non-intrusive and non-invasive, and not only does it detect change in small populations, it's a vast improvement on the previous method, toe clipping! Many of the field techniques, technology and population modelling programmes developed for the recent grand and Otago skink research work are of international significance. It is also, within New Zealand, immediately transferrable to the protection of other threatened fauna on the mainland. Foremost, though, is the prediction that as a result of markedly reducing the threat from predators to grand and Otago skinks, their threat status could be reduced. In less than a decade it could change from 'Nationally Critically Endangered' to 'Nationally Endangered'. For many years DOC has been aware of the significance of grand and Otago skinks and their vulnerability to both predators and habitat loss. The DOC recovery team's recent research showed that removing predators by either intensive trapping or holding them within a mammal-proof fence, was very successful. Protection of both species is being supported by the continuation of that work, along with some new and innovative projects. Trapping at the Macraes Conservation Area, the main focus of the recovery team's field work, has been extended. The exclosure fences will continue to protect the populations within, and monitoring will continue over the warmer months. As a further protection for grand and Otago skinks a captive management plan has been prepared and implemented. This is intended to protect both species against a catastrophic event, and also maintain a reserve of genetic diversity. The aim is that animals bred in captivity will be re-introduced into secure, wild habitat. Several private breeders are involved, some with up to thirty years lizard breeding and keeping experience. Two experienced wildlife breeding organisations are also involved. Wellington Zoo Trust has established a separate skink breeding area for both species, away from the public gaze. All the skinks are from the wild and housed in breeding pairs. The other organisation is the Isaac Wildlife Trust at Peacock Springs, where a purpose built unit has been constructed for Otago skink breeding pairs. These were captured from the wild and are genetically important. They are from a conservation area near Hawea and represent the Otago skink's western population, which has a different genetic makeup. The original DOC Grand and Otago Skink Recovery Plan was approved in 1995. That plan set in place a series of steps to promote the recovery of both species. The plan's long-term vision was: "To ensure the continued survival of wild populations of Otago skinks and grand skinks within their natural geographic range." Those aims continue in the new draft recovery plan, circulated for formal consultation in September 2006. Many submissions were received analysed and reviewed by the recovery group. The agreed changes are included in the current version of the plan. DOC welcomes any comments or suggestions you may have about the conservation of grand and Otago skinks. These can be directed to the recovery group via any of the department's offices. Reports of sightings of grand and Otago skinks are welcomed at any DOC office. Ideally, a report would include GPS/grid locations, a photo of the skink/s, and/or a description of the skink/s and where they were found. Landowners with a grand or Otago skink population on their property are encouraged to contact DOC. That knowledge is important to the conservation of both species, and advice on how to protect and maintain that population is available. The Grand and Otago Skink Recovery Programme supports the work of the Central Otago Ecological Trust. This is a community group based in Alexandra who want to re-introduce Otago skinks into their area, an important part of the species' former range. The Trust has been breeding Otago skinks in captivity in special housing, beside the LandCare Research and DOC offices in Alexandra. They will be released into a mammal-proof, fenced area, which is being constructed near Alexandra, and for which considerable funding has been raised. Find videos about Grand and Otago skinks. Otago skink rangers Sandra Soeder and Tim Lever share their special experience seeing an Otago skink giving birth in the wild.